I wanted to track which IP addresses were sending requests to my WCF service. So I did some investigation and apparently it’s not so hard to retrieve this data. The RemoteEndpointMessageProperty class makes the client IP address and port number associated with the remote endpoint from which a message was sent available. Underneath is a snippet of code that will show how it works. Today I created a method in my WCF service that would process an ArrayList. There was no possibility to pass a generic list due to interoperability reasons. In this ArrayList I would place objects of a certain type. This would then be processed server side. The formatter threw an exception while trying to deserialize the message: There was an error while trying to deserialize parameter http://tempuri.org/:handlingunits. The InnerException message was ‘Error in line 1 position 342. Element ‘http://schemas.microsoft.com/2003/10/Serialization/Arrays:anyType’ contains data of the ‘http://schemas.mshelp.com/HandlingUnit:HandlingUnit’ data contract. The deserializer has no knowledge of any type that maps to this contract. Add the type corresponding to ‘HandlingUnit’ to the list of known types – for example, by using the KnownTypeAttribute attribute or by adding it to the list of known types passed to DataContractSerializer.’. Please see InnerException for more details. The problem here is that WCF does not know how to serialize the type of the object that is contained within the ArrayList. The solution to this is actually very simple, you just need to make the type known to your service. In this post I will explain to you how you can configure your WCF proxy client to return a generic list as a collection type instead of an array. When you specify in your service contract that an operation should return a generic list, WCF will by default send your collection over the wire as an array. Now if you are going to consume the service and try to call the method that we just created you will see that you will not receive your generic collection. Instead you will just receive an array of Materials. 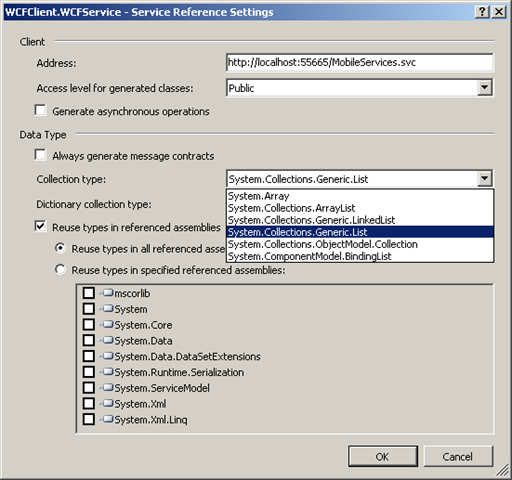 You can actually let the WCF service return all sort of collection types, it’s just a matter of configuration. So let’s properly configure it! 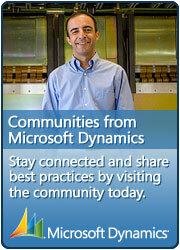 Right mouse click on the service reference that we created and select “Configure Service Reference”. Here you will immediately see that you can specify something for the Collection type and the Directory collection type. 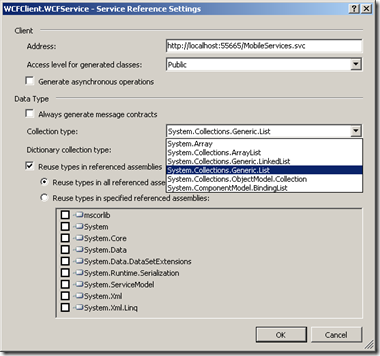 That’s right…here we can set the correct collection type that the service should return. The directory collection type can also be set here. Let’s configure it to return a generic list. If you want to use the svcutil.exe to generate your proxy class, you need to use the /collectionType (/ct) switch to specify the correct collection. The DataContractSerializer class is the successor of the XmlSerializer class. Introduced together with WCF. This one is also being used by WCF for serialization by default. You can of course always switch back to the good old XmlSerializer if you want to. Anyway, if you wanted to serialize a collection with the XmlSerializer you had to use the XmlArrayAttribute. With the DataContractSerializer you get the CollectionDataContractAttribute class. Personally, I think that serializing a generic list via the DataContractSerializer is easier then with the XmlSerializer. Even with the DataContractSerializer I think they could have done it easier. Youâ€™ll see what I mean in a minute. Letâ€™s look at some code. The example will be a simple to-do list. You can specify a name, a due data and multiple tags. The class TodoList will contain all the different todoâ€™s and the Todo class contains the properties we already discussed. As you can see I also have two other classes. The TagList and the InternalTodoList, both marked with the CollectionDataContract attribute. You also see that these classes contain the generic lists. I did this because you can only add the CollectionDataContract attribute to a class or struct. As you can see I use the XmlDictionaryWriter class, which was also introduced with .NET 3.0. For the desrialization weâ€™ll use the XmlDictionaryReader class together with the DataContractSerializer. Now for a simple test, letâ€™s add some to-doâ€™s. Donâ€™t forget to define the _myTodoList, which is of course an instance of the TodoList class. The aforementioned code will generate the following XML. Hope this post was informative and if you have comments, remarks. Please let me know, any constructive feedback is welcome.